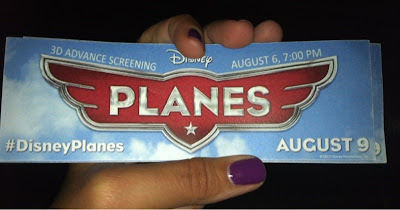 Disclaimer: I was provided with free passes to the 3D advance screening of Disney Planes. All opinions are my own. Last night we went to see Disney Planes and before I tell you all about the movie and why we loved it, I need to tell you how MAJOR this was for us! We haven't been to a movie theater in years. The last time we went to see a movie was the sensory screening for Cars 2 and The Boy was scared to go in and kept asking to leave. The movies - until last night - have always been a challenge for us. And I was skeptical about taking him to see Planes because I didn't know how he would react or if he would even stay. But The Boy likes to watch Wreck It Ralph in 3D at home and he keeps the glasses on so we decided to give Planes a go. And I'm so happy we did! The Boy waited on line. He sat in his seat the entire time. He kept his glasses on. And when it got too loud, he put on his noise reducing headphones. There were moments when he spoke too loudly. But in a theater full of kids, no one even cared. I was so proud of him last night. And I'm grateful that Disney makes such awesome movies that The Boy can enjoy in a theater and not just in the comfort of his own home. And I feel good knowing that we have one more family fun activity to add to our list. If your kids love Cars they will ADORE Planes! I don't want to give anything away but Planes is everything you'd expect from a Disney classic - simply fun for the kid in all of us. I was laughing out loud and cheering along with every other kid in the place. And Dusty...as a mom of a kid with autism, I really love the message he sends to our kids. Speaking of El Chu and Dusty...looky who joined The Boy for breakfast this morning! Planes opens in theaters on Friday August 9th! For Disney Planes Coloring Pages click HERE.